As the events coordinator at the posh Buckhead boutique, Sara Mixon knows a thing or two about dressing for the party. (After all, she’s been there 13 years.) Her approach to gloomy weather? Go cheerful. “This dress is perfect for brightening up a rainy-day wedding,” she says. “The cherry blossoms are highly celebratory, representing new life,” says Sara Mixon. A gold stacked heel keeps you from sinking into the wet grass. This local haberdashery with four metro area locations has been dressing Atlanta men since 1963. 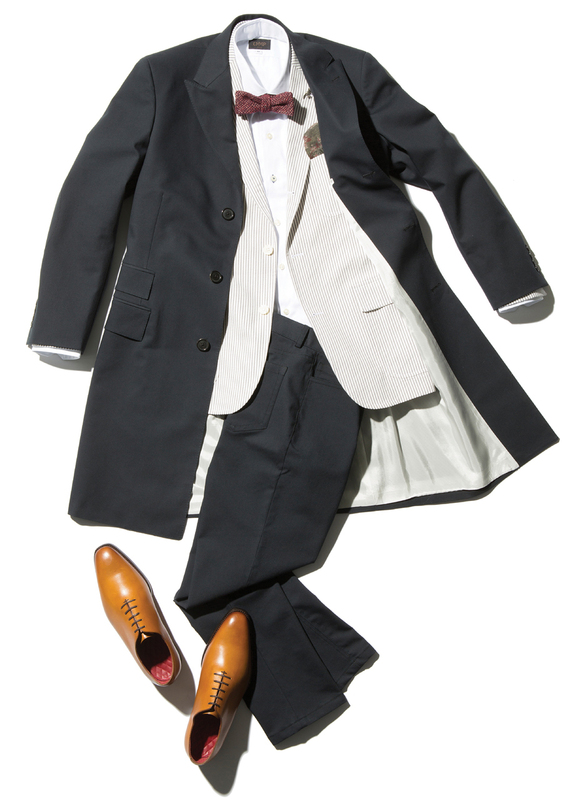 Creative director Matt Smith put together this dapper look that’s lightweight and breezy but fully protected. He’ll hold the umbrella for his date, of course. With all the layers, it’s hard to keep cool. 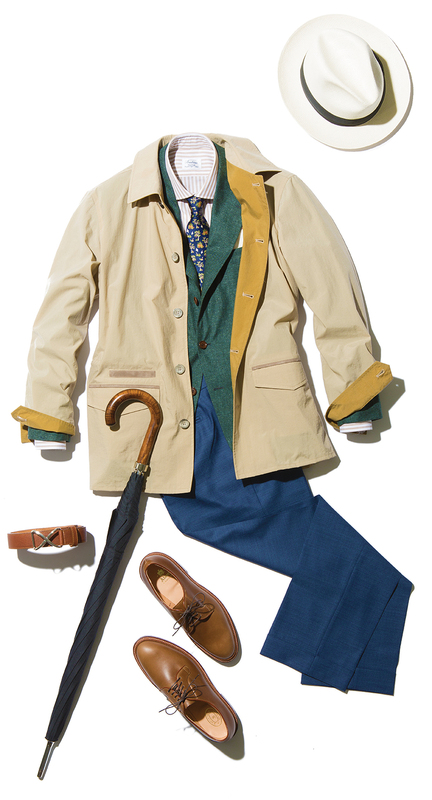 Go for a silk/linen Donegal and a lightweight rain jacket. “Tough as nails”—these have a water-resistant oiled leather sole. Panama hats aren’t just for the sun—this one is Teflon coated and can keep a light sprinkle off your brow. Elizabeth Kane Wing opened her Westside boutique in 2014, bringing cool contemporary brands and hard-to-find accessory labels to Atlanta. The dress she chose, by Hunter Bell, is made of scuba material, so no need to worry about ruining your look in the drizzle. Eight Fifteen heels (exclusive to Kane in Atlanta) are designed for comfort—so you can dance all night. The fun citrus color and the scuba material make this a bright choice for rain. Just next door to Kane is this custom and bespoke menswear shop founded in Philly in 2008. In 2014 partner Mike Mast moved to Atlanta to open the company’s second shop, and he’s been suiting guys up in immaculate, not-too-traditional, not-too-hip duds from their own line ever since. In spring in the South, you can pair a wool bow tie with a seersucker blazer. Both the raincoat and the pants are made from a water-repellent performance fabric. They make a great alternative to jeans or dress pants. This article originally appeared in our Spring/Summer 2016 issue of Style Book.